The theme this year is ‘Message on a Bottle’ and we encourage everyone to check out the details and enter! 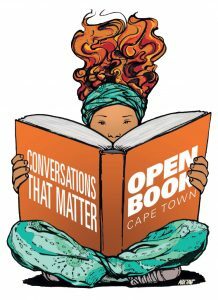 Special thanks must go to Cape Town based graffiti artist, Mak1one, for the new Open Book character. We think she is absolutely beautiful and are looking forward to seeing her on our street posters and programmes soon. Keep your eyes on our website to keep up to date on who is joining us this year. All participants can be seen here. Alternatively, check our the #cocreatePoetica and Comics Fest pages to see who is joining those areas of the festival. The programme will be available on our website in early August and tickets will go on sale through Webtickets at the same time. I am a self publishing author seeking to enquire the requirements for exhibiting at the Open Book Festival 2018. Is trh program open to registration? If so, what are the requirements? Hi there – the only books available during the festival are those written by participants I am afraid. We don’t offer exhibition space. If you would like to be considered in the future, please contact us between October and February and we will add you to the list.